fastboot.exe -i 0x0fce oem unlock 0x"my Sony unlock code"
I dug the web to find a similar case, without any success... did I miss something? You said you're running fastboot.exe -i but the error is unknown option -- i. Do you see the difference? You're running fastboot.exe --i - two dashes. 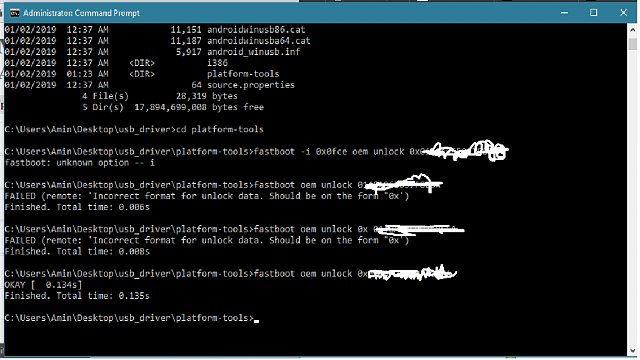 Bye the way, fastboot is enough, you don't have to specify fastboot.exe in a command prompt. if there's a fastboot.exe and no fastboot.com, fastboot.exe will run. And have you read https://developer.sony.com/develop/o...ck-bootloader/? You have to unlock it in debug first. Yes, I've followed this guide, without any success. And obviously, my Xperia is in debug mode. Same issue with Xperia XZ1 Compact here. Are you also using Windows 10 1803 ? yes, still haven't found anything till. It must be related to the platform-tools v 28.0.0. Trying the same with ubuntu gives exactly the same error message. GREAT.... fastboot R26 works fine for me! Thank you!! Just been struggling with this myself. I really don´t know what else to try, do anyone have any ideas please?